Soon I’ll be back in Grand Bahama fishing for a week at East End Lodge. This little slice of the Bahamas is the home of the memories created by catching my first bonefish. I’ve been a few times and have found wonders there. 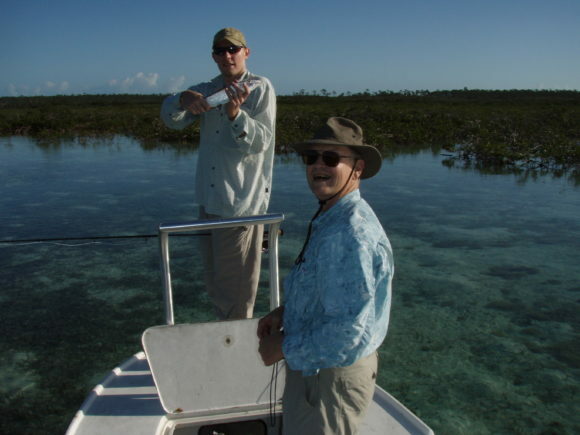 Here’s the story of my first bonefish, caught within 5 minutes of East End Lodge back before EEL existed, in 2008. 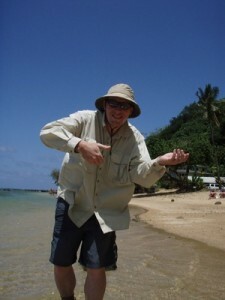 I had seen bonefish in Hawaii and they were unimpressed. The fish themselves were incredible specimens, to this day, probably the largest I have ever seen. I lacked the skills or knowledge to do anything more that gawk at them, but that was the spark. Knowing next to nothing about saltwater fly fishing, I asked about the Keys and was told if I actually wanted to catch a bonefish I should look further East to the Bahamas. The Bahamas, I was told, was where a saltwater noob, like myself, could make it happen. A plan was hatched and I roped my dad into the trip, threatening future visits with his granddaughter if he didn’t come along. 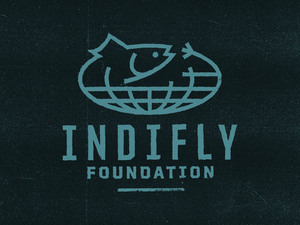 We certainly looked the part, there in the Miami airport, kitted out in the flats anglers uniform… the quick dry pants, the long-sleeved muted color flats shirt, maybe from Columbia, maybe Patagonia, maybe from the Ted Fey Fly Shop in my home town along the Upper Sacramento River. You can spot a fisherman in the airport as much by the uniform as by the rod tubes. We know the members of our tribe. Our guide picked us up early the next morning from a dilapidated, but cheap, motel in Freeport. He did not wear the uniform and did not look the part. His long white tee-shirt, his baggy jeans, the gold chain, the un-laced sneakers… he was not what we were expecting, but was recommended by a Florida guide I knew by reputation, so we were rolling with it. I have vivid recollections of the van ride out to the East End and the driver and our guide carrying on an indecipherable conversation (I picked up every 10th word) intermingled with conversation directed our way, of which I understood everything. Bahamians have the ability to open the door to you, and to close that very same door, simply by choosing the version of English they employ. The drive from Freeport to McCleans Town passes through hamlet sized settlements arranged sporadically along the only East-West road on the long, thin island. It takes about an hour to reach that eastern end and this drive was my first real glimpse of the Bahamas. The thin pines stood out as I couldn’t understand, in this land of hurricanes, how these spindly pine trees could possibly beat out all comers and climb their way up the evolutionary ladder. I also remember seeing the half-built and sometimes half-destroyed homes along the road. I later learned that good years, when the sea proves especially bountiful, a family might lay a foundation or pour some concrete and then the family might need to await another good year to build the next wall or put the roof on. Rocket mortgage isn’t an option for a Bahamian lobsterman. Some of these homes were also the victims to hurricanes or too many down years. McLeans Town is the largest settlement on the East End, which means maybe a hundred or two inhabitants. The dock was lively as we pulled in. A small boat arrived carrying passengers from Abaco which lay somewhere beyond the horizon. Other small boats were getting in or heading out. Our skiff was waiting and we were quickly away, my dad, me and our guide. Since this first trip in a skiff I’ve had dozens more. Some rides are long, maybe an hour, and some are choppy, slamming down in the troughs as you try not to injure a back or a testicle. Few trips have been as short. That first run in a skiff was maybe 5 minutes. The water we found ourselves on was like a spring creek flowing through mangroves. I didn’t have a notion of tidal flows and didn’t expect to be in a drift boat in the Bahamas, quietly gliding over sand and mud and grasses and weeds. It was peaceful and sunny and not too windy, perfect conditions. I was in the bow for maybe 2 minutes when the guide called out the school of fish. Dumbfounded looking out at shifting currents and the light dancing on the shallow bottom, weeds rippling in the soft current… I saw no bonefish. Still, my eyes straining, feeling a bit dumb, knowing there were maybe a dozen bonefish within casting distance and I had no real notion of where they are outside of these pronouncements from the guide standing fifteen feet behind me, three feet above. Here, he must have spun the boat, because I don’t recall this as a 12:00 shot, although, this was a decade ago now and the details may have slipped some. Panic rising in the back of my throat now, I still don’t see them. Then they were there, in front of me. I saw them all at once, a school, almost too many to see an individual fish, 11 o’clock, 40, maybe 35 feet. I made the cast. The guide told me to strip, strip, strip. I did as instructed. The fish ate and I don’t recall now, but I’m sure there was a little trout set in there. I don’t see how there couldn’t be, but I don’t remember the set. 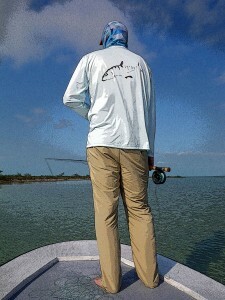 What I do remember, and what strikes most people on their first bonefish, was the raw power of the run. Only large steelhead had ever made my reel howl like that and nothing had shown me my backing as quickly. It felt like the biggest fish I’d ever had on, ever. It was maybe a pound. First bonefish ever caught, horrible handling, I know. That was it. I was hooked. I loved the visual aspect. I loved seeing the fish as opposed to casting at the place you think the fish will be. I loved the wind in the mangroves and the clear water and being barefoot and the pull of the fish, the power. More fish were caught that day. The guide proved to be excellent at his craft and truly horrible at making polite conversation. He served us one of the best meals I have ever eaten anywhere. It was memorable in so many ways. That trip and that first fish were an inflection point. Prior to that I thought mostly of large trout, steelhead, with a dream trip being for taimen. I knew rivers. I tight-line nymphed for countless trout. 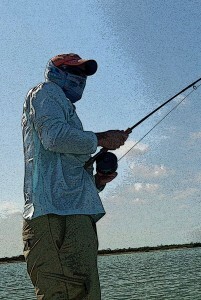 From that point on I have been pre-occupied by bonefish and saltwater flats, improving my casting, learning to cast in the wind and how to tie gotchas in endless variations. Since that day, I’ve had bonefish on the brain. Kind of fun to see bonefishing through the eyes of a beginner. I found this article about some folks fishing with the Pinder brothers. All across the web, fisherman talk about this fish and how addicting it is to hunt the fish. Jeffrey Pinder told us, “My favorite thing about Bonefishing is that it is a combination of hunting and fishing, so there is never a dull moment all day.” This is the truth. The whole experience is nothing short of a meditation on the water. So if it is a peaceful break from the busy hustle bustle that is calling, this may be the ticket whether you are an avid angler or a city boy who has never touched a fishing pole. Whatever way you look at it, a day with the Pinder brothers will leave you with a Bahamian history lesson, new found fishing skills, enough laughs to give your abs a workout, and a zen meditation that would make a monk brew envy. A special day for Matt, who I don’t know at all. A first bonefish. Glad to see him sporting the Skinny Water Culture, as well! The guide is Captain Jeffrey Pinder. 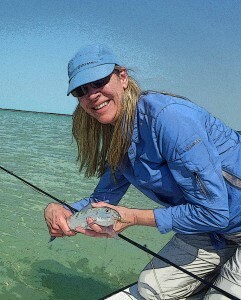 Now, Sarah has a leg up on most folks starting out trying to find their own bonefish. Her husband is one of the best anglers I know, my friend Shane. 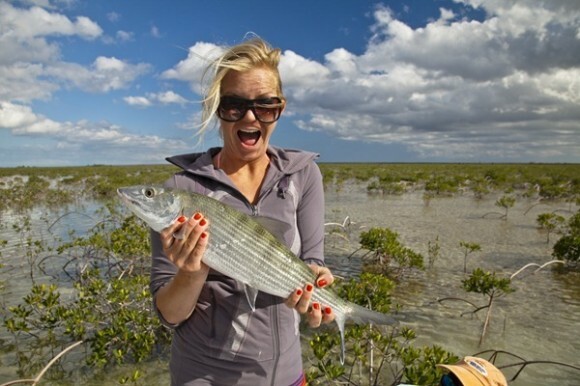 She’s had a pretty good teacher and that can really reduce the learning curve, but it is still an accomplishment to score your first bonefish. secretly think that’s when he starting thinking about making me his wife. excited only to cast and find out the hard way that my line is wrapped around my foot. him run.” Did I mention the wind? What can go wrong will go wrong when bonefishing. But, once in a great while, the fish gods smile down upon you and everything goes right. You can always count on the Deneki Blog to deliver the goods. I manage to hook my thumb first thing. A few practice casts, lots of opportunities, lots of failed casts to get to the fish, loads of flailing. “Cast now! Tip down! Strip, strip, strip!! !” again and again and again. Man, Charlie has loads of patience. I’m casting at fish I can’t see, I’m casting half the distance where the fish supposedly is, the wind is totally screwing any chance I have of getting the fly close to the fish. “Strip, strip, strip! !” “Little guy on! !” I’m not skunked, I couldn’t be happier. Got the little guy in the boat, and fumbled around in an attempt for the picture of possibly my only fish. 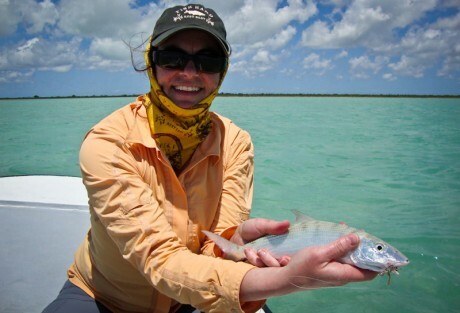 via Bonefishing Report from a Rookie | Kellsey Perkins at Andros South. We all have a place where we first wet a line in pursuit of bonefish (or at least there is a pretty good chance of that if you are reading a blog called Bonefish on the Brain). This is where I first saw a bonefish. There are some bonefish here... the biggest I've ever seen with my own eyes. It’s a nice place. It’s very nice. It’s been a few years since I’ve been here. I hope to make it back. Indeed, there is a campground here that is cheap and I often have dirtbag fantasies about spending a week in a tent here living off of slightly cool beer, Ritz crackers and peanut butter. It will forever be a special place to me even though I didn’t hook a fish there. I saw them… and they were frigging huge. Dear god man, they were big. I want to be there right now. The flat is pretty big and it bends around a point so you can’t see the whole thing from the far edges. The bottom is a far cry from white sand. It is a “rubble” flat comprised of old, dead coral. 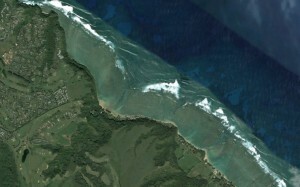 The live stuff is still kicking, just further out from the beach than you’d be walking. The coral and the urchins make your choice in wading boots kind of important (leave those dive type shoes at home, you need more protection out there). There are deep cuts through the flats and those are useful things if you are a bonefish and want to travel up onto the flat. Those fish will emerge from and disappear into those channels. I have heard that there are also sometimes fairly large sharks in those deep cuts. Keep that in mind. It would be great if I could tell you what kind of flies to throw… I don’t know. I didn’t hook a fish and didn’t have a follow (out of the 7 fish I saw). You do have to keep in mind the coral… and you need to put that into the mental calculus when it comes to tippets and spare fly lines (more than one fly line has been donated to the fishing gods because of that old coral). I want to make it back there… I need to make it back there… I will make it back there… someday. This River Is Wild. : 14 Months in the Making. I like this blog… I like this story. Check it out. Lately, things have clicked for me, at least. I’ve had a few unforgettable days on the water when Zach couldn’t make it and I felt more than a little bad at rubbing in my good luck, knowing that he had yet to land a bone of his own. My success, I think, is more a case of being able to be in the right places at the right times than any major increase in skill. Although, I know my eyes are much more attuned at spotting fish than ever before. via This River Is Wild. : 14 Months in the Making.. If you are looking to get into your first bonefish, I have a way you can do it for not much scratch (ya know, relatively speaking). Step 1. Go to Cheap Caribbean and look at either Nassau or Grand Bahama. Why? Well, you can get package deals, including air fare for as low as $300 a person. Figure it usually costs $350 for air, and you can see the value here. You might not get the most super awesome hotel, but you’ll get to the Bahamas cheap. 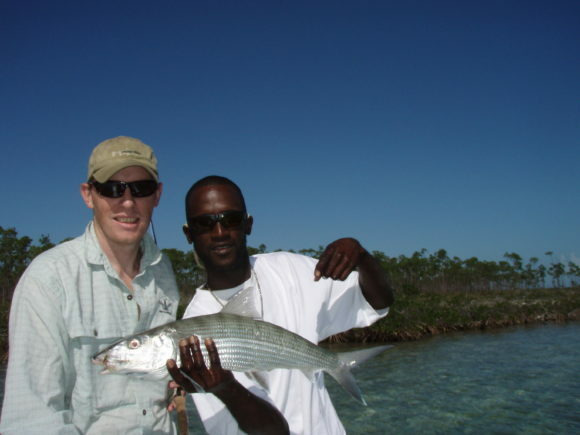 Sure, you can get to Miami pretty cheap too, but the fishing there is tougher and if you are starting out, it is good to have some success on your first outing… ya know… encouragement. Step 2. Get one day with a guide. Why? If you are starting out, it can be really hard to find your own fish. Bonefish have their own rhythms and their own environment, so, get a guide to smooth out the learning curve a bit. In Grand Bahama, I recommend Captain Perry (although his website is down as I write this, he is still booking trips and you can call him at (242) 353-3301) who I used and who was just a great guide and a good person. In Nassau, which is overall a bit less bonefishy than Grand Bahama, there are still options where the guide can put you in a skiff and get you to some fish. Aaron Bain with Secret Soul gets some good reviews. Now, a day of guiding is going to set you back a pretty penny… about $400, plus tip, but really, you want to catch some fish when you go all that way, so you really should look into it. It isn’t like fishing the Madison where you know the place is lousy with fish. If you have DIY inclinations, you can go out on your own for the rest of your trip, like I’ve done a couple times. Nassau and Grand Bahama are family friendly locations and you could make it a family trip, making it even more doable for the family-bound angler. There… that’s the recipe. If you fish for steelhead or large trout, you probably have something serviceable in terms of gear. 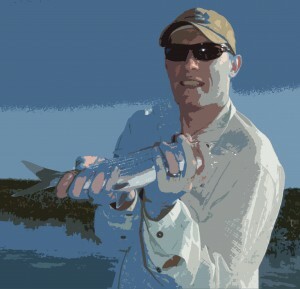 A 7 weight will work for bonefish and you can even get away with a 6 (ask Rich French). You may need a new line and you might… might need a new reel, but you can get a reel that will work for under $200. As I read in This is Fly long ago, and I’m paraphrasing here, “bonefishing shows up on a lot more wish lists than obituaries,” so go out there and get after them.